A professonal DVD convert & author software provider since 2002. 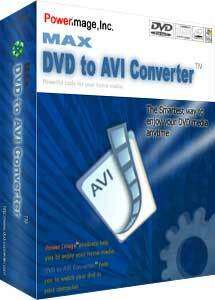 Max DVD to Avi Converter is a easy to use rip tool with powerful function and excellent performance which from DVD disc to avi file. It can convert you home DVD to high quality Avi media file with DivX or XVid video encode and MP3 or MP2 audio encode. You can select whole movie or part of segment that you favorite to convert process and the output file can been comminuted for any size as you want. There are many languages and subtitles in a dvd disc usually, you can select which language and subtitle will be included in the output avi file before you begin the convert process. The internal decode engine has supported all region of DVD disc, even the CSS DVD. Copyright@2009, PowerImage, Inc. All rights reserved.